UK university students are graduating with such large debts that about three-quarters of them will likely never pay them back, according to new findings from the Institute for Fiscal Studies (IFS). The IFS says people will still be paying off student debts into their 50s. Meanwhile, it says, the short-term savings to public finances, achieved through replacing grants with loans and raising fees, are lower than long-term savings, if people ultimately do not repay their loans. The problem is not just one of high fees: interest rates on student debt are very high, equal to 6.1% in March, which further increases debt and reduces the chances of full repayments. At current levels, the average student will rack up £5,800 of interest on their loan before they even graduate. Rates on student loans are set at 3 percentage points above the retail prices index, which is currently at 3.1%. “Interest rates on student loans reached up to 6.1% in March 2017 and are very high compared with current market rates,” said Chris Belfield, co-author of the report. “Combined with high levels of debt, this increases average debt on graduation by £5,800. There is no impact on the repayments of the lowest earners, but the highest earners can expect to repay up to £40,000 in interest payments,” he said. The 2012 reforms to higher education raised the upper threshold for fees to £9,000 per year, and replaced maintenance grants with loans. Although this increased course funding and reduced government borrowing, it has resulted in poorer students incurring higher levels of debt, and is predicted to cause problems in the long-term. Replacing maintenance grants with loans means the poorest students often end up with the biggest debts — which could be more than £57,000 after a three-year degree. 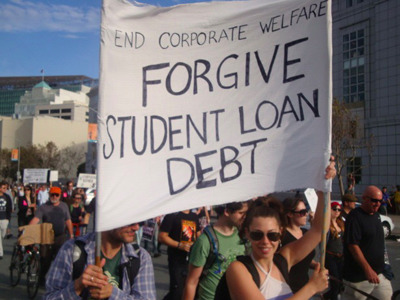 Students not eligible for maintenance loans are likely to graduate with debt of £42,500. According to the IFS, reforms since 2012 have impacted middle- and low-earning graduates most: repayments from the poorest third of graduates have increased by 30%, while those from the richest third have increased by less than 10%. “Recent policy changes have increased university funding and reduced long-term government spending on Higher Education while substantially increasing payments by graduates, especially high-earning graduates,” said Jack Britton, co-author of the report. “There is probably not much further to go down this route, but proposals for reducing student fees tend to hit the public finances while benefiting high earners the most,” he said.